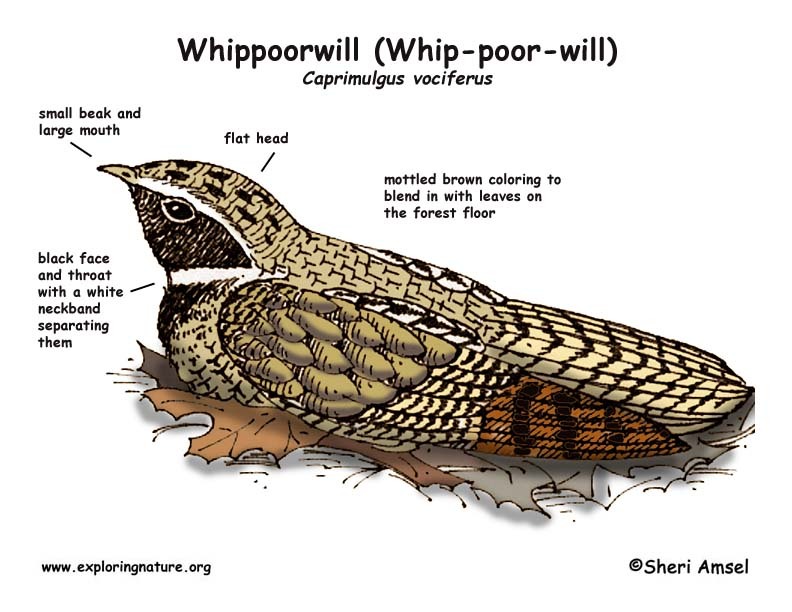 I woke up this morning to the song of a whippoorwill. First of the season! I love that sound. Every year when winter begins to wane, I await the plaintive three-note cry of this elusive bird. Whippoorwills are nocturnal birds in the nightjar family Caprimulgidae. Of the six nightjar species in North America, central Florida is home to two, the slightly larger-bodied Chuck-will’s-widow, Caprimulgus Carolinenesis, and its more commonly known relative the Eastern Whippoorwill, Antrostomus vociferus. 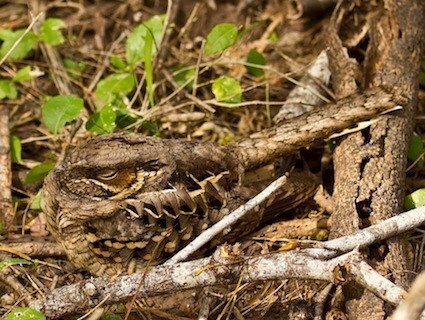 During the last couple weeks, I’ve had the feeling I’d soon be hearing a nightjar’s call. On three recent pre-dawn rows through the still water of Hour Lake (my new name for our homestead’s 12-acre pond) in Groveland, I inadvertently flushed large, fluttery birds from along the leaf-littered shoreline. From the size, shape, movement and timing of these three avian encounters, I suspected the discovery of nightjars. Although I’ve listened to whippoorwills for years, the sudden rush of movement from those three encounters was only the second time I’ve actually come close to seeing one. On each occasion, it has always been too dark and too brief an encounter for me to identify which nightjar species I had unexpectedly startled. Most recently, the birds only fluttered a few feet down the shoreline to another hidden spot on the forest floor where, try though I did, I was unable to find them. That’s how it is with nightjars. These surprisingly loud and persistent callers are notably hard to see. Even experienced birders have trouble finding them due to their well-camouflaged plumage. The medium-sized owl-shaped body of all nightjars is covered with a mottling of brown and gray feathers, which enables them to blend seamlessly into their preferred habitat - leaf-littered forests with limited understory plants along the edge of fields and water. This specialized habitat provides the short-legged, large-mouthed ground bird with the requirements it needs to do what nightjars do best - catch insects at night and find hidden roosting spots by day in the low branches of trees, logs and stumps. Since I had recently startled several birds while rowing in Hour Lake in Groveland, that’s where I expected to hear the first whippoorwill of the season. But that’s not what happened. On Saturday, Ralph and I arrived at our place in New Smyrna Beach and the next morning as I was waking up I heard a familiar tune filtering through my bedroom window along with the light of the nearly full moon. “I know that sound!” I said to myself. Kicking off the covers, I got up, opened the sliding glass door and stepped outside where a whippoorwill - or was it a Chuck-will’s-widow? - was loudly chanting its namesake call. Although the two birds sound slightly different, both repeat a similar three-note refrain used to attract mates and define territory. The only way I can distinguish between the two is to listen carefully comparing both bird calls in my head, something which still-sleepy-Sherry finds hard to do at 5:45 in the morning. As satisfying as it would be to know for sure which species I was hearing, my pleasure was not tied to a successful ID. There was special delight early this morning, hearing a familiar voice in an unexpected place. As a longtime central Florida resident, I consider a nightjar’s cry to be the sound of spring, heralding in the changing of seasons in my adopted home. More importantly, it’s a reminder that beauty doesn’t always need to be seen to be appreciated. 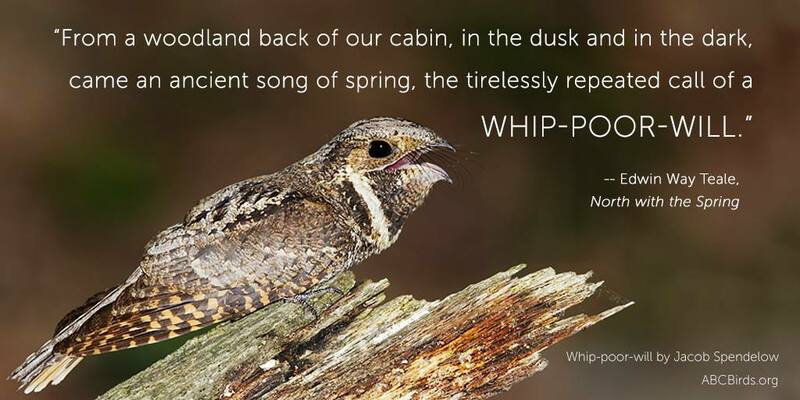 Beauty can be felt, touched and - in the case of the persistent whippoorwill - heard repeatedly by those willing to listen during those elusive and fleeting few hours of dawn and dusk. Want to learn more about nightjars?